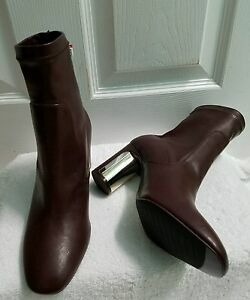 ZARA BURGUNDY HEEL DETAIL ANKLE BOOTS EUR 38/39 US 7.5/8 REF. 7137/101 NWT!!! thuyquach29 has no other items for sale. Details about ZARA BURGUNDY HEEL DETAIL ANKLE BOOTS EUR 38/39 US 7.5/8 REF. 7137/101 NWT!! !